A very warm welcome to the 2019 school year! A special welcome to new staff, students and families who are joining the St Thomas More’s Primary School community for the first time. I hope everyone’s time at STM is exciting, rewarding and happy. Last week staff participated in a week of professional learning. Together we looked more closely at being “centred in learning” through Inquiry Learning. We also spent a day in prayer and being “centred in faith”. Fr Josh and Fr Emil celebrated Mass with us, which was the perfect opportunity to come together as a staff community in prayer. Friday was a full day of First Aid training for all staff. I am very excited about the year ahead and feel so privileged to have dedicated and hardworking educators in our school. Your children are very fortunate! Congratulations to Miss Cassie Halls, now Mrs Neiufi, on getting married during the Summer break. The newsletter is emailed out to families every Wednesday. On odd weeks, we have “More News” and on even weeks we send out “More Reminders”. 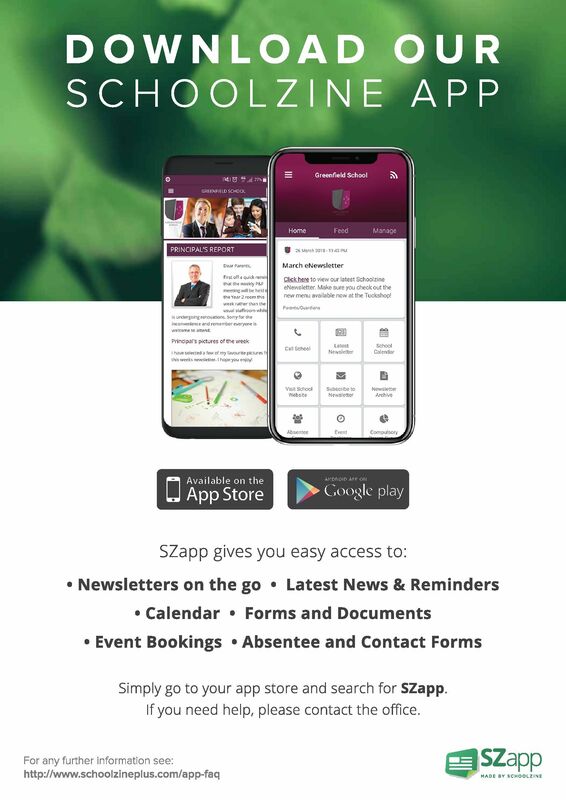 The electronic copy can be accessed through our Schoolzine app and on the school website. 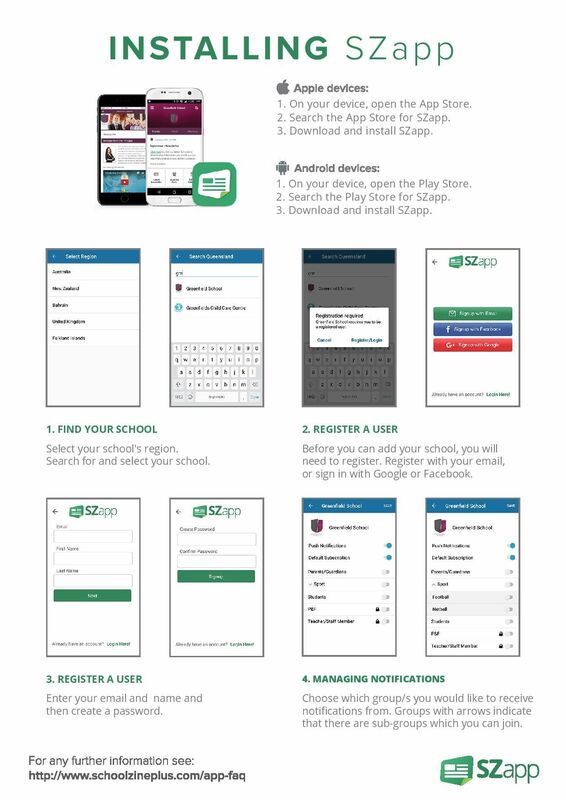 You can access the SZAPP link via the school website or by clicking on the following link . http://www.schoolzine.com/szapp. 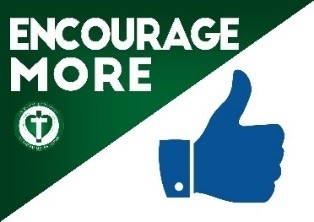 At all times, we expect students to respect more, think more and encourage more. Perhaps families could discuss these expectations at home. We also have the “No hat; No play” expectation. It might be a good idea to have 2 hats at school – one in your child’s bag and one that can be left in the classroom. We have a new counsellor this year. Her name is Jaye Corkeron. Jaye will work every Wednesday, 9am to 12pm. 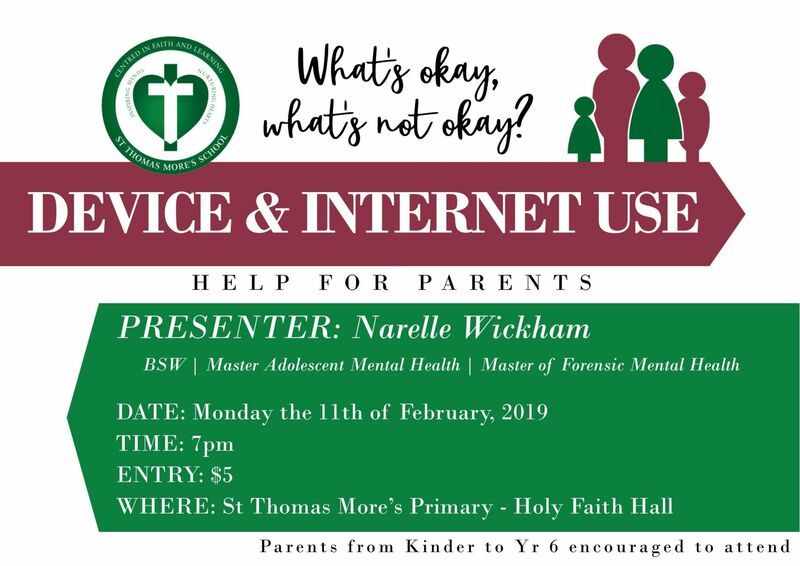 Parent Information Night is in Week 3, on Tuesday the 19th of February. Please come along at 5.00pm to visit your child’s classroom and to meet their teacher. We are offering 2 sessions with the same information; First session will be at 5pm; second session at 5:40pm. I would like to advise that staff will respond to emails during professional working hours across the working week. For emergencies, please email me on julie.wiley@cg.catholic.edu.au. Yesterday a letter was sent home about the St Thomas More’s Parent Network. This network provides an opportunity for all parents to be connected with other families. We encourage all families to provide their details for the class contact list to promote communication and being kept informed of important class events. Please complete the form and return it to your child’s teacher by the end of Week 2. We are also looking for one parent volunteer to be the “class contact” for each class. Being a class contact is a great way to get to know families in your child’s class and be involved in the school community. If you are interested in being a class contact or have any questions, please contact Julie Ogden at the Front Office. Students are supervised each day from 8.20am until 3.30pm. I would like to remind parents of the importance of ensuring that children are not dropped at school prior to 8.20am. Before and After School Care is available at our school. Thank you to families for ensuring students are in full school uniform. P.E. days are Wednesday and Friday. A reminder that runners must be predominantly white. Also, boys are to wear navy socks with their summer uniform (not white). White socks are to be worn with the PE uniform. Next Friday,15th February at morning drop off, stop by the hall kitchen area for a cuppa and chat. The School Community Council will be there; it’s a good chance to mingle and get to know other parents. The second-hand clothing pool will also be open. Our Year 6 leaders will be presented with their badges during our assembly on Friday, February 22nd (Week 3). Parents are warmly invited to join us for this special assembly. It will begin at 9am, after the welcome breakfast. Welcome back! I trust you all enjoyed your holiday break with loved ones and are ready to begin the school year. I also welcome any new families to St Thomas More’s School and know that you will very much enjoy your time here. This year, staff, students and St Thomas More’s School community will tune in, ask questions, explore deeper, make connections and reflect on the life of St Paul the Apostle and his teachings on how to live in community. St Paul the Apostle was once named Saul. St Paul grew up in Tarsus, a large city in Turkey. He moved to Jerusalem when he was 14 years old to continue his studies of the Torah. St Paul wrote 13 books in the New Testament. His stories were written before the Gospels. St Paul would encourage communities to live in harmony, work COLLABORATIVELY and to be KIND and FAIR. St Paul established the Early Church throughout the Roman Empire. In this Scripture, St Paul is writing a letter to the Corinthians and explaining to them how to live in one community, celebrating everyone’s gifts, and worshipping only one God. Each term we will support a new understanding of what it means to live in community. 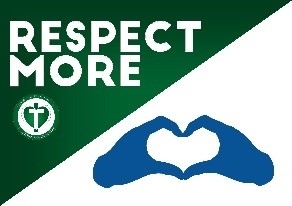 Term 1: We are a community of peacemakers. Term 2: We are a Eucharistic community. Term 3: We are a community living with the Spirit. Term 4: We are a community Centred in Faith. I wish you all a peaceful start to the school year. Welcome and best wishes to everyone for a great 2019. I sincerely hope our new families find St Thomas More’s to be welcoming and friendly and soon feel part of our community. For our new families (not Kindergarten), Help Sheets with class information have been sent home. It would be great if you could return the Getting to know you sheets to the School Office by Monday 12 February (start of Week 2). 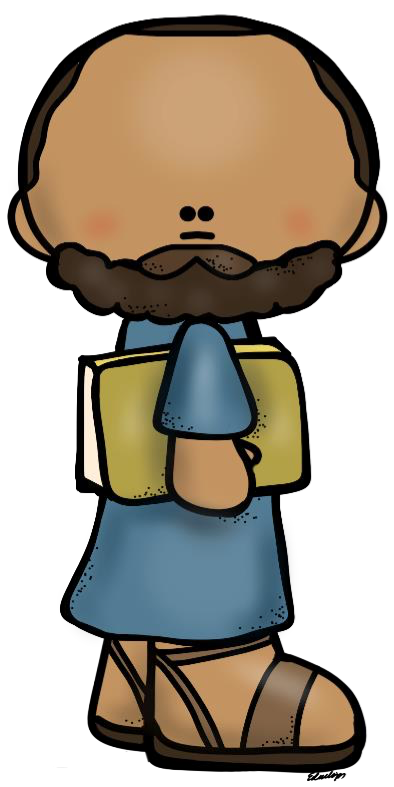 St Thomas More’s DSM Support 2019 forms have been sent home this week to all Defence Families and it would be appreciated if these could be returned by Friday 15 February (end of Week 2). Craft/lego sessions will be held on Monday lunchtimes (after eating time) and relaxation sessions on Tuesdays 1.40pm beginning in Week 3. These sessions will be organised on class rotation throughout the term. 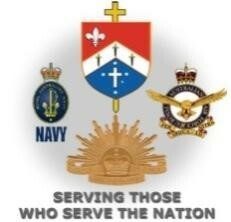 Deployment Group will be held on Tuesday and Wednesday lunchtimes (after eating time) starting in Week 3. Please let me know if your family has a Defence parent away (whether it be deployment, course or exercise) and your child would like to attend the Deployment Group. The Defence Education Assistance Scheme (EAS) is available to Defence students who have moved school as a result of posting (applicable for up to 18 months after moving) and need additional services to help them meet the academic standards of the new school. The application and reimbursement processes for the EAS are managed by the Defence Family Helpline 1800 624 608. Please contact me if you would like more information. Please be aware that Defence Community Organisation renamed the Defence School Transition Aide Program to Defence School Mentor (DSM) Program. As of 2019, the position title at St Thomas More’s Primary will be known as Defence School Mentor (DSM). Notes will be sent home in the next week seeking volunteers for St Thomas More’s Called to Care Meal Bank. Called to Care Meal Bank is a roster of volunteers willing to cook one meal for four people. The meals are kept in the school freezer and given to families who are experiencing a hard time for whatever reason. It is anticipated that as a volunteer you may be rostered to contribute once or twice a year (depending of the number of volunteers and the need). This is a great way to show love and care within our own community to families when extra care and support is needed. All families are warmly invited to the St Thomas More’s Community Breakfast on Friday, 22 February (Week 3) from 8-8.50am in the undercover area adjacent the library. 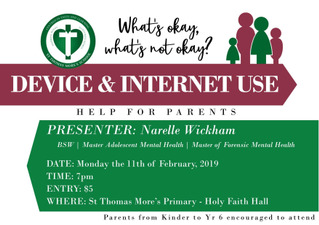 This is an opportunity to welcome our new families and come together for a chat. Coffee, tea, fruit juice, croissants, muffins and fruit will be on offer. Notes will be sent home this week requesting an RSVP for catering purposes, however, no payment is required. Music tuition is available at St Thomas More’s during school hours. 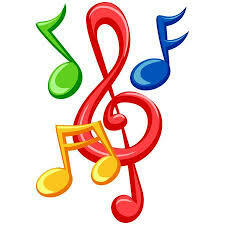 If you would like your child to learn a musical instrument contact the Tutors directly . Join a Tennis Canberra junior tennis group and learn a sport you can play for life. Groups for all ages and abilities - FREE Trial Available! Contact us via email play@tenniscanberra.com.au or 0416 186 121.